Name Variation Helen Farrell was also known as Ellen. Married Name circa 1879 As of circa 1879,her married name was Mears. Helen Farrell was born in June 1852 at New York. She was the daughter of Patrick Farrell and Julia Harrington. Helen Farrell married John Mears, son of Andrew Mears and Margaret Howard, on 25 November 1879 also reported as 25 Nov 1880. Helen Farrell died in 1929. Name Variation Thomas Edward Mears was also known as Tom. Thomas Edward Mears was born on 5 July 1880 at Sauk, Wisconsin, Twin with James. He was the son of John Mears and Helen Farrell. Thomas Edward Mears married Stella Martha Mears, daughter of Michael Mears and Anna M. Kaney, circa 1909 first cousins. Thomas Edward Mears died on 22 April 1965 at Racine, Wisconsin, at age 84 Thomas Mears obituary. He was buried after 22 April 1965 at Saint John the Evangelist Catholic Cemetery, Spring Green, Sauk, Wisconsin. Thomas Edward Mears obtained US Social Security Card at Wisconsin; last residence Wisconsin. 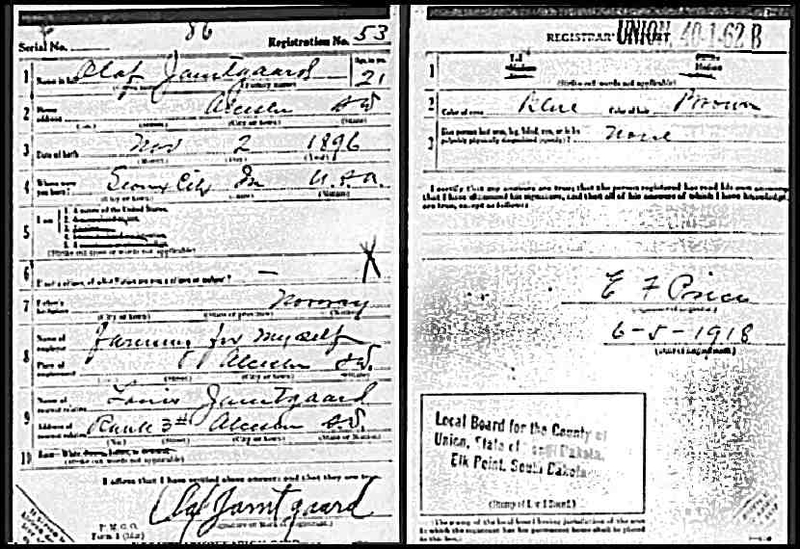 On 12 September 1918 at Sauk, Wisconsin, occupation: saloon keeper. [S250] U.S. Federal Census 1930 U.S. Federal Census, by Ancestry.com, ED56-35. Dwelling 118. Sheet 5B. [S373] U.S. Federal Census 1940 U.S. Federal Census, by Ancestry.com, Year: 1940; Census Place: Baraboo, Sauk, Wisconsin; Roll: T627_4523; Page: 14A; Enumeration District: 56-6. James Mears married Molly Purcell. James Mears was born on 5 July 1880 at Sauk, Wisconsin, Twin with Thomas. 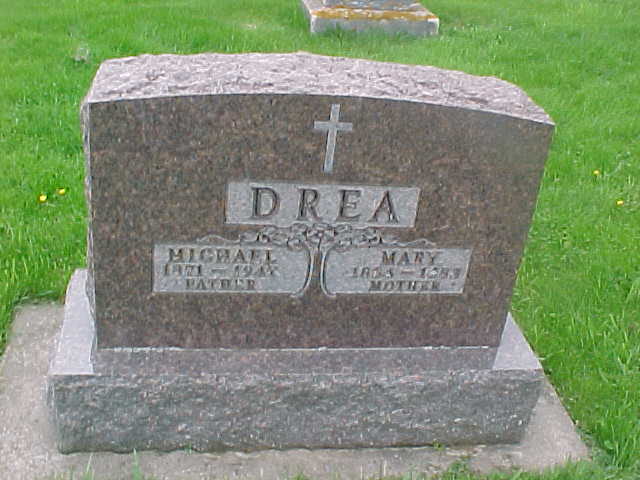 Married Name circa 1907 As of circa 1907,her married name was Drea. Mary Mears was born in July 1884 at Wisconsin. She was the daughter of John Mears and Helen Farrell. Mary Mears married Michael T. Drea, son of William Drea and Catherine Aspel, circa 1907. Mary Mears was buried in 1953 at St. Patrick's Catholic Cemetery; New Loreto, Bear Creek, Sauk, Wisconsin. She died in 1953 at Sauk, Wisconsin. Name Variation William Patrick Mears was also known as W. P.
William Patrick Mears was born in June 1888 at Wisconsin. William Patrick Mears married Clara Anna Fargen, daughter of Martin Fargen and Mary King, circa 1914. William Patrick Mears died on 12 November 1954 at Richland Center, Richland, Wisconsin, at age 66 William P Mears obituary. [S243] U.S. Federal Census 1920 U.S. Federal Census, by Ancestry.com, Dwelling 160. Married Name Her married name was Knack. Married Name Her married name was Knech. Name Variation Margaret Mears was also known as Maggie. Margaret Mears married Henry Knech. Margaret Mears was born in August 1891 at Wisconsin. Margaret Mears and Henry Knech lived in 1965 at Milwaukee, Wisconsin. Name Variation Ralph Frank Rohlfsen was also known as Frank. Ralph Frank Rohlfsen was born on 10 October 1912 at O'Brien, Iowa. He married Irene Julia Larson, daughter of Jens Moller Larson and Ida Andrea Abraham, on 21 June 1941 at Sioux Falls, Minnehaha, South Dakota. Ralph Frank Rohlfsen died on 14 April 1996 at age 83. Ralph Frank Rohlfsen obtained US Social Security Card at Iowa; last residence Sioux City, Woodbury, Iowa. Married Name 14 February 1943 As of 14 February 1943,her married name was Sommervold. Gertrude F. Popken was buried at Union Creek Cemetery, Union, South Dakota. She was born on 20 December 1918 at Portland, Plymouth, Iowa. She was the daughter of Otto John Frederick Popken and Emma Amelia Schwarting. Gertrude F. Popken married Alvin O. Sommervold, son of Peter Alfred Sommervold and Olivia Abraham, on 14 February 1943 at Immanuel Lutheran Church, Akron, Plymouth, Iowa. Gertrude F. Popken died on 30 December 2014 at Akron, Iowa, at age 96 Gertrude "Gert" Sommervold, 96, of Akron, Iowa passed away Tuesday, December 30, 2014 at the Akron Care Center in Akron. Funeral services will be 11:00 a.m. Saturday, January 3, 2015 at Union Creek Lutheran Church, rural Akron, Iowa. Reverend Carla Nelson will officiate. Burial will follow in the church cemetery. Visitation with the family present will be from 10:00 a.m. until service time on Saturday and following the service during a time of lunch and fellowship, all at the church. Arrangements are with the Carlsen Funeral Home - Schroeder Chapel in Akron. Expressions of sympathy can be extended to the family through www.carlsenfuneralhome.com. Gertrude F. Popken was born December 20, 1918 on the family farm in Preston Township, rural Plymouth County, Iowa, the daughter of Otto and Emma (Schwarting) Popken. She was baptized into the Christian faith at St. John Evangelical Lutheran Church - Preston Township. She attended country school in Preston Township. 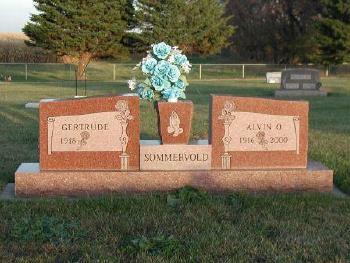 Gert was united in marriage to Alvin Sommervold on February 14, 1943 at Immanuel Lutheran Church in Akron. She and Alvin farmed in Union County, South Dakota for over 40 years. In 1984, they retired and moved to Akron. Alvin passed away May 29, 2000. In December of 2009, Gert became a resident of the Akron Care Center. Gert was a longtime member of Union Creek Lutheran Church where she was active in W.E.L.C.A. for many years. Through the years, Gert enjoyed gardening, ceramics, and watching and feeding birds. She will be remembered for her cooking and baking, especially her pies. But most of all, she loved the times spent with her family, especially her grandchildren and great grandchildren. She will be greatly missed. Survivors include her son and his wife: Alan and April Sommervold of rural Akron; a granddaughter: Tara (Greg) Pirak of Gayville, SD and their children, Brett, Derek, and William; a granddaughter: Amber (Jim) Saloum of Sioux Falls, SD, and their daughter, Elena; a sister: Ella (Gordon) Swanson of Sioux City, IA; a brother in law: Arlo Sommervold of Sioux Falls, SD; and several nieces and nephews. 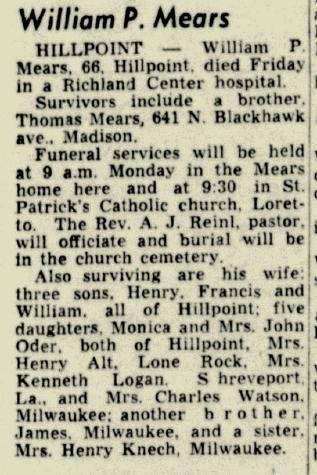 She was preceded in death by her parents; her husband, Alvin; her siblings: Bill (Regina) Popken and Lenore (Roland) Rohlfs; and her sisters in law: Mary Sommervold, Opal (Jay) Robertson, and Pearl (Henry) Wilkens. [S243] U.S. Federal Census 1920 U.S. Federal Census, by Ancestry.com, ED136. Dwelling 72. [S250] U.S. Federal Census 1930 U.S. Federal Census, by Ancestry.com, Dwelling 37. Sheet 2B. ED75-27. Name Variation Otto John Frederick Popken was also known as Otto J. F.
Otto John Frederick Popken was born on 23 January 1889 at Oldenburg, Germany. He married Emma Amelia Schwarting on 4 April 1913. Funeral services for Otto J. F. Popken, almost 69 years of age, were held at Trinity Lutheran church Saturday afternoon with Rev. O. F. Pittack in charge. Committal was in Riverside cemetery of Akron with the Barnard Funeral home in charge. Otto John Frederick Popken was born to Hinrich Popken and wife, Friedericke Christine, near Jever, Oldenburg, Germany, on January 23. 1889, and spent his entire childhood and youth in Germany. At the ago of 23 he immigrated recently to the United States and arrived at Le Mars, Iowa, in April of 1912. A year later, on April 4, 1913, he was married to Emma A Schwarting by Rev. Volhnar, Lutheran pastor in Le Mars. During the next 25 years he was engaged in farming on a number of farms east of Akron, all in Plymouth county. On March 1, 1948, he retired and moved into his home on Avenue F in this city and in 1950 he transferred his membership from Immanuel Lutheran church of Akron to the local congregation. He served his local congregation as a recorder of vital information and statistics, and his community and city he served as the caretaker of the city park for a number of years and retired from this occupation in 1955 on account of his health. In 1953 he returned to Germany to join his confirmation class the golden anniversary of their confirmation. From May 6 to August 17, 1957, he went to Germany again, this time to conduct a tour of visitors from America. For a number of years he was failing in health. On Labor Day 1955, he suffered a heart attack and was taken to the local hospital for recovery. Last December he submitted to an operation in a hospital in Sioux City. On Wednesday. January 15, he returned to this hospital for a checkup. Shortly after he had gone to his assigned room be was stricken with a heart attack to which he succumbed. He was preceded in death by his wife on February 28, 1951, his parents and one brother. Surviving are a son, William of Akron; three daughters. Mrs. Gertrude Sommervold and Mrs. Lenora Rohlfs, both of Akron, and Mrs. Ella Swanson of Sioux City; eight grandchildren; one brother, Fred of Akron; six sisters, Mrs. Elizabeth Johnson, Mrs. Marie Vander Hamm and Mrs. Herbert Buchre, all of Akron, and Mrs. Frieda Popken, Mrs. Martha Molzen and Miss Anna Popken, all of Le Mars. Hawarden Independent, Hawarden, Iowa, Thursday, January 23, 1958. Married Name 4 April 1913 As of 4 April 1913,her married name was Popken. Emma Amelia Schwarting was born on 10 May 1891 at Oldenburg, Germany. She married Otto John Frederick Popken on 4 April 1913. Emma Amelia Schwarting died on 28 February 1951 at age 59 Mrs. Otto Popken, 59, died at the Hawarden hospital early Wednesday morning following a long illness from leukemia. Mrs. Popken had been ill for approximately two years. A year ago she sought-medical aid at the Mayo clinic at Rochester, Minn. The past year she submitted to many blood transfusions at the Hawarden hospital. She became critically ill Tuesday. 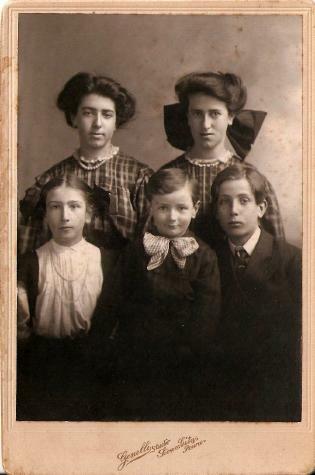 Emma Amelia Schwarting was born May 10, 1891, in Golzwarden, Oldenburg, Germany, and came to America in her youth. She was confirmed in the Lutheran church in Germany. On April 4, 1913, she was married to Otto Popken at Le Mars. For many years she lived on a farm in the Akron vicinity. Mr. and Mrs. Popken came to Hawarden about three years ago. She is survived by her husband four children, Mrs. Roland Rohlfs, Mrs. Alvin Sommervold and William of Akron, and Mrs. David Swanson of Sioux City; two sisters, Frieda Schwarting of Chicago and Sophie Schwarting who resides in Germany; one brother, William of Williamsville, N.Y. and four grandchildren. Funeral arrangements had not been completed Wednesday afternoon. The body was taken to the Barnard Funeral Home. Hawarden Independent, Hawarden, Iowa, March 1, 1951. Jay Douglas Robertson was born on 16 July 1919 at LeMars, Plymouth, Iowa. He was the son of John Robertson and Ruth Dean. Jay Douglas Robertson died on 27 June 1984 at age 64 AKRON, Iowa - Jay Douglas Robertson, 64, of Akron died Wednesday in the Veterans Hospital in Sioux Falls, S.D. after a long illness. Services will be at 1:30 p.m. Friday in the Union Creek Lutheran Church, rural Akron. The Rev. Benard Nelson will officiate. Burial will be in the church cemetery. A prayer service will be at 7:30 p.m. today in the Schroeder Funeral Home in Akron. Mr. Robertson was born July 16, 1919, at LeMars. He married Opal Sommervold June 8, 1949, at Akron. He farmed in the Akron area for 15 years, operated a laundromat in Marcus from 1964 to 1974, and was a mechanic for International and John Deere from 1974 until retiring in 1983. Mr. Robertson was an Army veteran of World War II, serving in Italy, North Africa and the Middle East. Survivors include his wife; two daughters, Mrs. Richard (JoEllen) Puttmann of Sioux City and Miss Beth at home; two sisters, Mrs. Donald (Darlene) Lucken of Akron and Miss Marjorie of San Francisco, Calif. And one brother, Calvin of Akron. Sioux City Journal (Sioux City, Woodbury County, Iowa) of 29 June 1984. He was buried after 27 June 1984 at Union Creek Cemetery, Union, South Dakota. John Robertson married Ruth Dean. John Robertson was born circa 1895 at Iowa. Married Name Her married name was Robertson. Ruth Dean married John Robertson. Ruth Dean was born circa 1896 at Iowa. Denise Robertson was born on 29 July 1957 at Akron, Plymouth, Iowa. She was the daughter of Jay Douglas Robertson and Opal E. Sommervold. Denise Robertson died on 29 November 1962 at age 5 Akron, Ia. - Special: Funeral services for Denise Olivia Robertson, 5-year-old daughter of Mr. and Mrs. Jay Robertson, rural residents here, who died Friday at a Sioux City hospital after an operation, will be at 2 p.m. Sunday at Union Creek Lutheran Church near here in South Dakota. Burial will be in the church cemetery under the direction of the Lewison funeral home. She was born July 29, 1957 in Akron. Survivors in addition to the parents are two sisters, Jo Ellen and Beth, both at home; the grandparents, Mr. and Mrs. Alfred Sommervold of Akron; a grandmother, Mrs. Ruth Robertson, and a great-grandmother, Mrs. Emma Dean, both of LeMars, Ia. Sioux City Journal (Sioux City, Woodbury County, Iowa) of 11/20/1962. Name Variation Henry Christian Wilkens was also known as Hank. Henry Christian Wilkens was born on 4 January 1917 at Big Springs, Union, South Dakota. He was the son of Fred H. Wilkens and Anna Renken. Henry Christian Wilkens was baptized on 17 January 1917 at Peace Lutheran Church. Henry Christian Wilkens died on 12 June 1981 at Morningside Manor, Alcester, Union, South Dakota, at age 64. He was buried on 16 June 1981 at Union Creek Cemetery, Union, South Dakota. Henry was confirmed in the Peace Lutheran Church on April 12, 1931. He lived in the Alcester community until entering the Army Air Corps on January 19, 1942. He returned from oversears duty in the European Theater on October 1945. During his lifetime, he was engaged in farming and served his church and community by holding positions as a Sunday School teacher, a member of the Union Creek Church council for several years and was a member of the Ludwig School Board. He was a charter member of the Alcester Veterans of Foreign Wars. Henry Christian Wilkens was a farmer. Fred H. Wilkens married Anna Renken. Married Name Her married name was Wilkens. Anna Renken married Fred H. Wilkens. Married Name 11 June 1955 As of 11 June 1955,her married name was Sommervold. Mary Louise Woods was born on 13 December 1935 at South Dakota. She died on 4 November 2008 at South Dakota at age 72 Mary Woods Sommervold, 72, born December 13, 1935 in Sioux Falls, SD passed away peacefully after a courageous battle with lymphoma. Mary attended All Saints School and graduated from Washington High School in 1952, and USD with a B.A. in 1956 and an M.F.A. 1957. 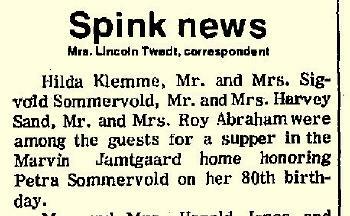 She married Arlo Sommervold in 1955. Mary taught music at Cleveland, Franklin, Edison, All Saints School and Lincoln High School. Mary hosted the daytime television show Party Line, was a Director of the Dakota Savings and Loan, and the first Executive Director of the South Dakota Symphony Orchestra. Very active in the community, Mary was the first recipient of the Mayor’s Award for the Arts, president of the South Dakota Symphony Guild, president of the South Dakota Symphony Board of Directors, on the National Endowment for the Arts, president of the Board of Trustees of the Washington Pavilion, first woman appointed to the Board of Trustees of Sioux Valley Health System eventually serving as president, served on the Board of Directors of Minnesota Public Radio, and as president of the South Dakota Board of Education. Mary was State Chair of Teen Age Republicans, National Chair of Teen Age Republicans and started the Teen Age Republican camps. Mary was the organist for All Saints School, Calvary Cathedral and Good Sheppard Episcopal Church. She was a member of Chapter AQ of PEO Sisterhood, Pi Beta Phi sorority and the Church of St. Mary. Grateful for having shared her life is her husband, Arlo Sommervold; her four children, Mary Ann Tech (Tim), Colorado Springs, Peter Sommervold (Sue), Sioux Falls, Jon Sommervold (Cate), Sioux Falls and Sara Friesen (Scott), St. Louis Park, MN; her sister Deede Meyers (Don), Paradise Valley, AZ; and her 12 grandchildren, Alexander Tech, Mary Elizabeth Sommervold, Madeline Tech, Erik Sommervold, Kathryn Tech, Charles Sommervold, Alison Sommervold, Gunnar Sommervold, Maxwell Sommervold, Joseph Sommervold, Noah Friesen and Lillian Friesen. The family extends an invitation to join in celebration of a life so well lived in the Great Hall of the Washington Pavilion of Arts and Science immediately following the memorial Mass. Committal services begin at 10:00 AM Saturday, November 8, 2008 at Woodlawn Cemetery, followed by a memorial Mass at 11:00 AM at St. Mary Catholic Church. The family will greet friends from 6:00 – 7:00 PM Friday at St. Mary’s with a scripture service beginning at 7:00 PM. Memorials my be directed to the Washington Pavilion or the SD Symphony. Marvin LeRoy Jamtgaard was born on 15 December 1919 at at home, Alcester, South Dakota. He was the son of Olaf L. Jamtgaard and Rose L. Buum. Marvin LeRoy Jamtgaard died on 14 January 2002 at age 82. Marvin LeRoy Jamtgaard obtained US Social Security Card at South Dakota; last residence Beresford, Union, South Dakota. He was a farmer. On 14 September 1975 at Spink, Union, South Dakota, attended Petra (Abraham) Sommervold 80th birthday celebration. [S243] U.S. Federal Census 1920 U.S. Federal Census, by Ancestry.com, ED245. Stamp 208. Dwelling 67. [S250] U.S. Federal Census 1930 U.S. Federal Census, by Ancestry.com, ED64-5. Dwelling 137. Name Variation Olaf L. Jamtgaard was also known as L. Olaf. Olaf L. Jamtgaard was born on 2 November 1896 at Sioux City, Iowa. He was the son of Louis O. Jamtgaard and Anna A. Solem. Olaf L. Jamtgaard married Rose L. Buum, daughter of Johan Johansen Buum and Betsy Jamtgaard, circa 1919. Olaf L. Jamtgaard died on 4 October 1948 at Union, South Dakota, at age 51. 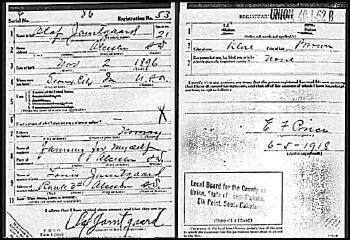 1905 Sioux City, Woodbury, Iowa Olaf L. Jamtgaard appeared on the census of 1905 in the household of Louis O. Jamtgaard at Sioux City, Woodbury, Iowa; household also includes Anna Ronning. Jamtgaard family circa 1909 Alice, Sophia, Bertha, Arnold, Olaf. [S245] U.S. Federal Census 1900 U.S. Federal Census, by Ancestry.com, ED166. Dwelling 57. [S244] U.S. Federal Census 1910 U.S. Federal Census, by Ancestry.com, ED182. Dwelling 72. Name Variation Rose L. Buum was also known as Rosie S.
Married Name circa 1919 As of circa 1919,her married name was Jamtgaard. Rose L. Buum was born on 9 September 1898 at South Dakota. Rose L. Buum married Olaf L. Jamtgaard, son of Louis O. Jamtgaard and Anna A. Solem, circa 1919. Rose L. Buum died on 13 September 1988 at age 90. Rose L. Buum obtained US Social Security Card at South Dakota; last residence Alcester, Union, South Dakota. Clarence Martin Zweifel was born on 1 March 1919 at Beresford, Union, South Dakota. He was the son of Joseph Zweifel and Anna Margaret Voegeli. Clarence Martin Zweifel died on 21 November 2009 at age 90 Clarence Martin Zweifel was born March 1, 1919 to parents Joseph and Margaret (Voegeli) Zweifel on their farm near Beresford, SD. He died on November 21, 2009 at Bethesda Nursing Home in Beresford, SD at the age of 90 years, 8 months and 20 days. Clarence grew up on the family farm and moved for the first time to the city of Beresford and the age of 60. He attended Silver Lake School #59 in Lincoln County for eight years. As a child and young adult he was a member of Zion Evangelical United Brethren church northeast of Beresford. He worked on the farm and also for the telephone company. He married Mildred Jeanette Sommervold on February 20, 1949. The couple became members of Emmanuel Lutheran Church in Beresford following their wedding. The couple lived on the Zweifel farm northeast of Beresford where they farmed with Clarences brother Albert. Clarence enjoyed his family, bowling, cars, gardening with his wife, and remained interested in farming even after his retirement. He is survived by four children: Darlene Zweifel, John (Valerie) Zweifel, David (Linda Kay) Zweifel, and Royal (Kay) Zweifel all of Beresford; eight grandchildren: Heather Zweifel and Danelle (Tom) Kamnikar, Sioux Falls, Janelle Zweifel, Murfreesboro, TN, Gregory (Candace) Zweifel, Beresford, Mark (Shana) Zweifel, Harrisburg, and Lori (Anthony) Laurvik, Luke Zweifel, and Lisa Zweifel all of Beresford; four great grandchildren: Austin Zweifel, Murfreesboro, TN, Maggie and Lily Kamnikar, Sioux Falls and Zachary Zweifel, Harrisburg; two sisters: Iona Carlson, Sioux Falls and Lorene (Freeman) Swanstrom, Beresford; three sisters-in-law: Laura Zweifel and Martha Jamtgaard of Beresford and Esther Zweifel of Alcester; two brothers-in-law: Morris Sommervold of Alcester and Bruce Nilson of Fergus Falls, MN; and many nieces, nephews, relatives and friends. 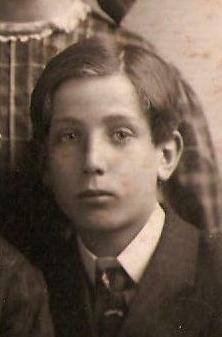 He was preceded in death by his parents, wife Mildred, five brothers, Albert, Jacob, Edward, Walter and Emil, sister Katherine Krause; sisters-in-law Rudi Nilson and Helen Sommervold ; brothers-in-law, Walter Krause, Merle Carlson, and Marvin Jamtgaard; nephews, James Zweifel and Lawrence Krause and many aunts, uncles and cousins. Funeral services will be held 10:00AM, Tuesday, November 24 at Emmanuel Lutheran Church, Beresford, with burial at Emmanuel Lutheran Cemetery, rural Beresford. Visitation will be Monday from 1PM to 5PM at Wass Funeral Home and resuming at 6:30PM at the church with a prayer service beginning at 7PM. Clarence Martin Zweifel was a farmer. The Joseph Zweifel farm has been in the family and farmed by three generations. First "Grandpa Joe", then Clarence and his brother Albert, and now (1991) Clarence's three sons, John, David and Royal. [S243] U.S. Federal Census 1920 U.S. Federal Census, by Ancestry.com, ED129. Dwelling 119. Sheet 10A. Name Variation Joseph Zweifel was also known as Joe. Joseph Zweifel was born on 8 July 1872 at Switzerland. He was the son of (?) Zweifel. Joseph Zweifel married Anna Margaret Voegeli, daughter of Joseph Voegeli and Anna Stuessi, circa 1903. Joseph Zweifel died in August 1962 at age 90. Joseph Zweifel obtained US Social Security Card at South Dakota; last residence South Dakota. He immigrated in 1890. [S244] U.S. Federal Census 1910 U.S. Federal Census, by Ancestry.com, ED272. Dwelling 169. Name Variation Anna Margaret Voegeli was also known as Margaret. Married Name circa 1903 As of circa 1903,her married name was Zweifel. She was the daughter of Joseph Voegeli and Anna Stuessi. Anna Margaret Voegeli married Joseph Zweifel, son of (?) Zweifel, circa 1903. Anna Margaret Voegeli died in January 1974 at age 88. Anna Margaret Voegeli obtained US Social Security Card at South Dakota; last residence Beresford, Union, South Dakota. [S245] U.S. Federal Census 1900 U.S. Federal Census, by Ancestry.com, ED218. Dwelling 60. Albert Zweifel was born on 22 June 1905 at North Dakota. Albert Zweifel died on 17 April 1995 at age 89. Albert Zweifel obtained US Social Security Card at South Dakota; last residence Beresford, Union, South Dakota. Dr. George O. Solem was born on 7 June 1888 at South Dakota also reported as Jun 1887. He was the son of Anders Olai Solem and Sigri Johnson Lund. Dr. George O. Solem married Lillian T. Kinloch, daughter of Dr. Edward Jenner Kinloch and Marie W. (? ), circa 1920. Dr. George O. Solem died in 1960. Dr. George O. Solem was a physician, general practice on 20 April 1930. [S250] U.S. Federal Census 1930 U.S. Federal Census, by Ancestry.com, ED416-2250. Dwelling 396. Name Variation Daniel Julius Solem was also known as Olson. Name Variation Daniel Julius Solem was also known as Daniel G.
Daniel Julius Solem was born on 30 January 1878 at South Dakota. Daniel Julius Solem married Marie Regina Lokken, daughter of Christopher Lokken and Regina Lund, on 9 October 1912 at Union, South Dakota, his name listed as Daniel J. Olson. Daniel Julius Solem died on 10 July 1943 at Minnesota at age 65. [S243] U.S. Federal Census 1920 U.S. Federal Census, by Ancestry.com, Year: 1920;Census Place: School District 20, Sheridan, Montana; Roll: T625_975; Page: 13A; Enumeration District: 204; Image: 1045. [S250] U.S. Federal Census 1930 U.S. Federal Census, by Ancestry.com, Year: 1930; Census Place: Jameson, Koochiching, Minnesota; Roll: 1102; Page: 3B; Enumeration District: 23; Image: 848.0. 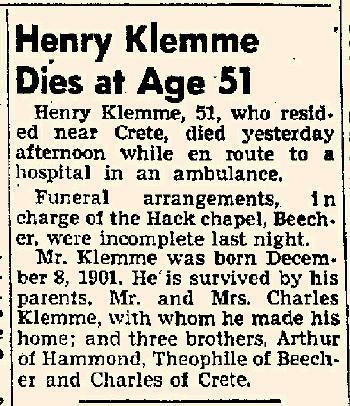 Henry E. Klemme was never married. He was born on 8 December 1901 at Illinois. 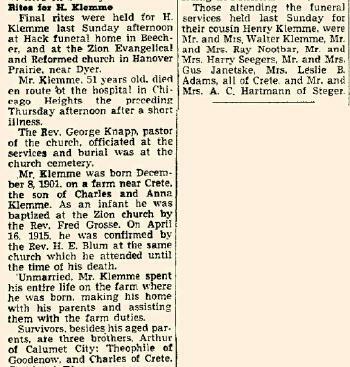 Henry E. Klemme was buried in January 1953 at Zion Evangelical and Reformed Church, Hanover Prairie, Dyer, Indiana, Henry Klemme funeral notice. He died in January 1953 at Will, Illinois, at age 51 Henry Klemme, 51, obituary. Name Variation Charles V. Klemme was also known as Charles W.
Name Variation Charles V. Klemme was also known as Carl. Charles V. Klemme was born on 24 December 1906 at Crete, Will, Illinois. Charles V. Klemme married Edna M. Wehrmann after May 1930. Charles V. Klemme died in March 1986 at age 79 Charles V. Klemme obituary. Charles V. Klemme lived with Christoph Karl Klemme in 1918 at Crete, Will, Illinois.4 In January 1956 attended Mrs Charles H Klemme Sr (Maria Claus) birthday party. 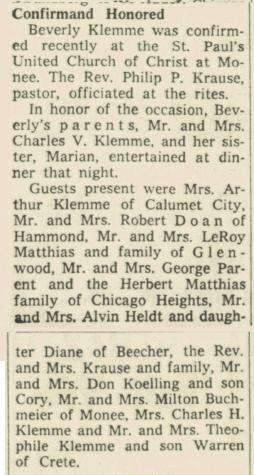 Charles V. Klemme and Beverly Ann Klemme were confirmed in 1959 Beverly Klemme confirmation announcement. Elmer W. Klemme was born on 27 February 1902 at Illinois. He was the son of Wilhelm Klemme and Emma Heldt. Elmer W. Klemme married Melba E. Dierking, daughter of Emil Dierking and Justine Engelking, on 7 September 1930. 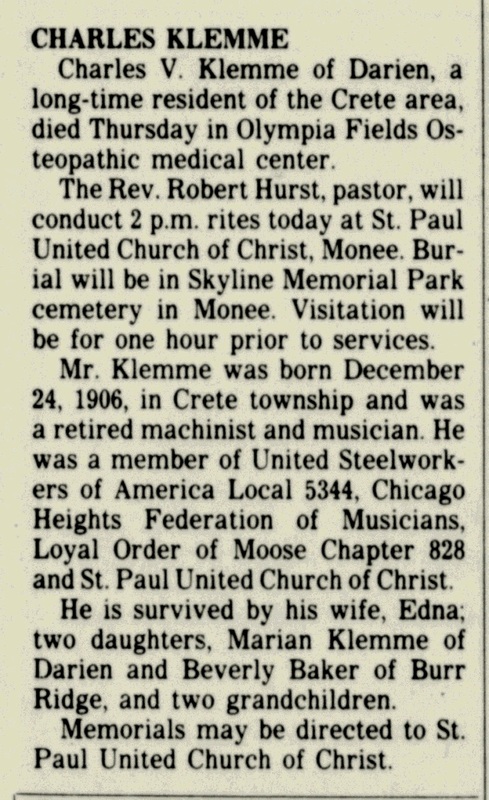 Elmer W. Klemme died on 17 October 1965 at age 63. 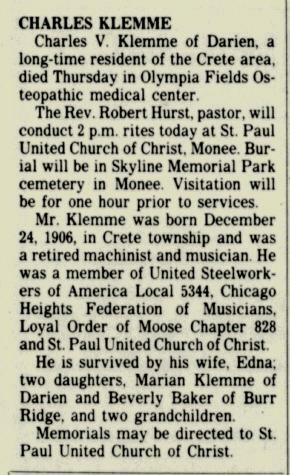 Elmer W. Klemme lived with Wilhelm Klemme in 1918 at Crete, Will, Illinois.5 On 12 July 1938 at Birthday celebration for Allen Klemme. Elmer W. Klemme was educated in 1940 at through 7th grade. [S373] U.S. Federal Census 1940 U.S. Federal Census, by Ancestry.com, ED45-14A. Dwelling 34.